5 Ways to Get Parents Excited About the New School Year! My Back to School Tips are all about getting parents excited about what's happening in your classroom. I have worked in schools with exceptional parent involvement and schools with almost no parent involvement. With experience on both sides of the spectrum, I know that the right kind of parent involvement can make a teacher's job INFINITELY easier. Heading into a new school year, it's important to get parents on board with your classroom vision as soon as possible. 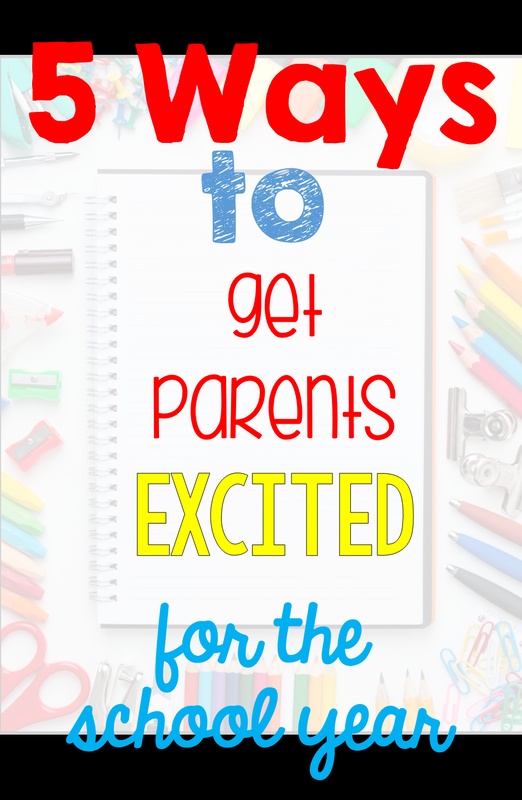 Here are 5 tips to hook your parents and keep them excited throughout the school year! Just a few tiny gestures can help get parents on your side right away. Most schools have a Back to School event right before school begins, or Open House at the beginning of the year. Consider putting out a small gift to show parents you appreciate them and want them to feel involved in your room. 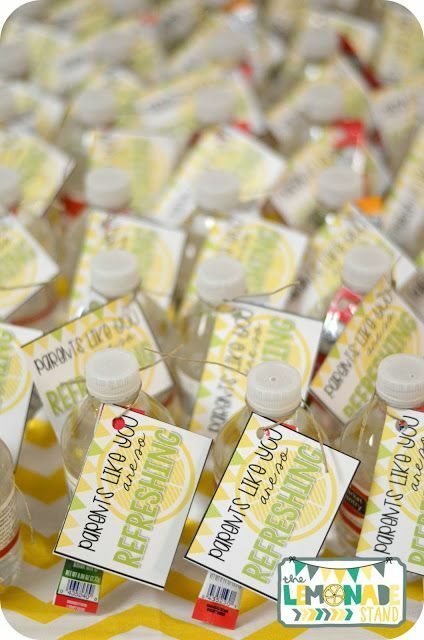 A water bottle and flavored drink mix with a tag reading "Parents Like You Are So Refreshing!" 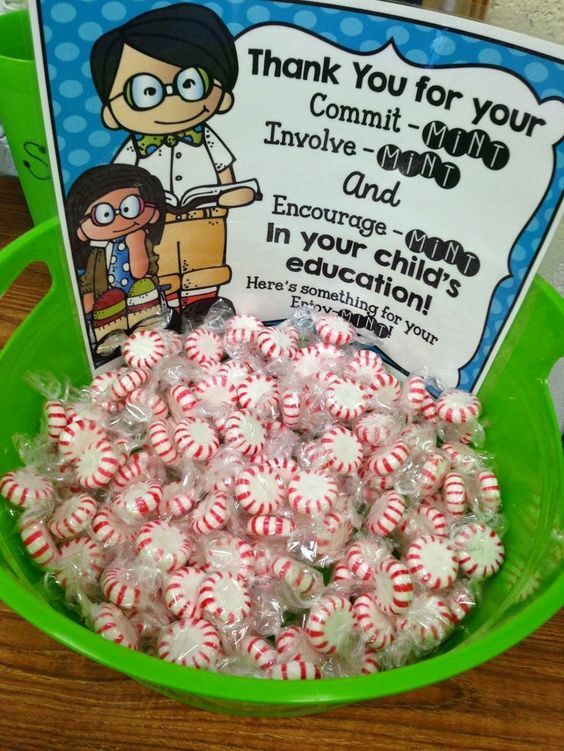 A bowl of mints to encourage parent "Involve-MINT"! You can also hand out a quick survey for parents to complete and return, asking them about their children and what their hopes are for the school year. This way your parents will feel as though you value their opinions and want their input! Above all, parents want to know what is going on in your classroom. There are several ways you can accomplish this. At my school, each teacher has a dedicated web page that we are required to keep updated. Every week I let parents know about the upcoming homework, any important dates and deadlines, and other important school information. I also upload directions to projects or anything else parents may need at home. Students also have a handbook covering all the classroom procedures that they keep in their homework binder. I upload a copy of this to the website as well. This way if one of my parents needs a quick answer and I'm not available, they can consult the handbook! 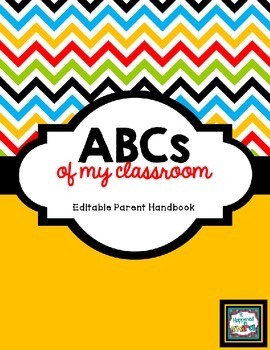 A copy of my Editable Classroom ABCs can be found for FREE in my TpT Store. Parents love to see what their children are doing every day. Try to take pictures as much as you can and send, send send! At my school we keep a list of all parent emails, so it's easy to send a picture from my phone. You could also use an app like Remind 101 or Class Dojo to send pictures home! Something I plan on doing this year is using my Polaroid Zip to catch students being good, and printing and attaching the photo to a positive note. The more parents see the awesome things going on in your room, the more they will want to contribute or participate when asked. Many parents want to help, but are unable to participate in the "traditional ways" such as going on field trips or coming in to help for holiday parties. In addition, a lot of families are struggling to make ends meet and unable to make donations for classroom supplies. To make all of your students' families feel important, you might need to think outside the box a little bit. In the past I have had parents cut out lamination, make copies, file papers, label books, and even put together gift bags for the students! This is a win-win situation...you get something taken off your to-do list, and parents feel like they are a valued part of your classroom community! 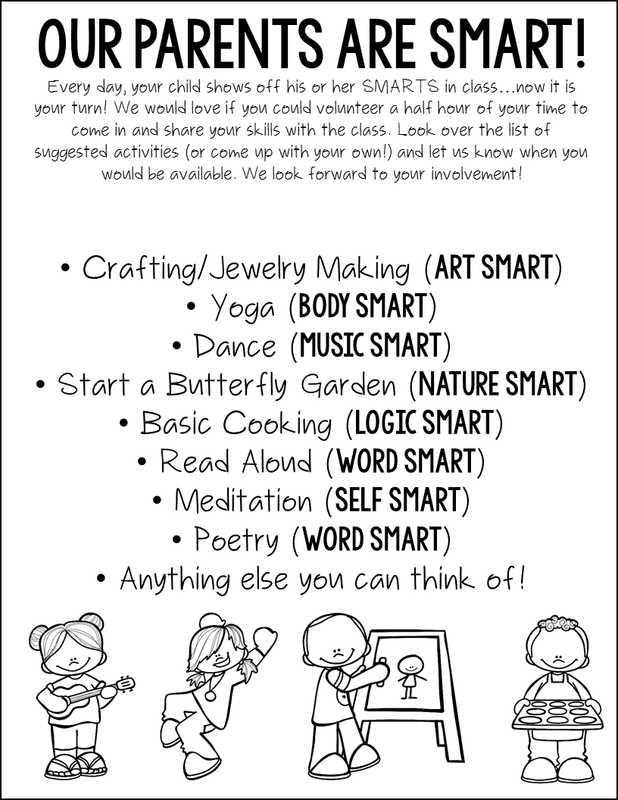 I think my students and parents will both love participating in these activities! Now, the part you've been waiting for! Use the rafflecopter below for your chance to win a $25 TpT gift card! Easy peasy! Now, hop on over to Jessicca's blog, The Third Grade Zoo, for more BTS tips and tricks! I love the Polaroid Zip idea. Attaching a photo to a positive note is a fantastic idea. Thank you! I think the parents will really love it! I encourage them to read my blog! Awesome! 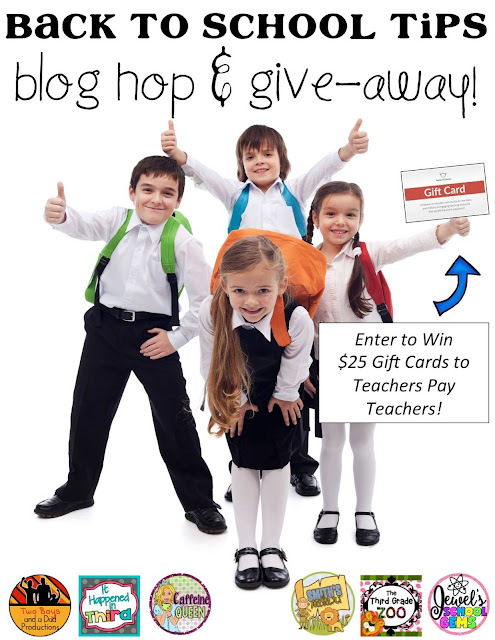 Blogging really helps give parents a window into our classrooms! I always translate anything I send home into Spanish & Arabic for my non-English-speaking parents. I love the idea of parents showing off their own SMARTs i n the classroom! I'd love to know what a vocabulary parade is...sounds so interesting! A vocabulary parade is when each student is assigned a word, and comes up with an elaborate costume to describe the word! It's inspired by the book Miss Alaineus: A Vocabulary Disaster. It's a lot of fun! These are great ideas! I think more parents want to be involved, but they often don't know where to start. BTW your blog looks great! Thank you so much, Karen! I'm lucky to work in a place with parents who are up for just about anything. I think it's so important for students to see their parents around the school as much as possible! Love the parents are smart idea! My parents love the class feed on Class Dojo! I'm going to try out the Remind app this year to keep parents informed. I'm also starting a private class blog where I will post pictures that our class photographer (one of my jobs) takes. I LOVE that class photographer is one of your jobs. So much fun! I almost forgot my tip...make contact with each child's parent at least once a nine weeks for a positive reason. Building a relationship is key!! Absolutely! It makes it so much easier if you unfortunately have to make contact for a not-so-positive reason if you have already built that relationship! I love the SMART ideas!!! Can't wait to try it in my classroom!!! Awesome! Please let me know how it goes! I try to make positive contacts with parents. That is so important! Sometimes just a quick email can make a huge difference!